Photo: From left, Lucinda with Kleary's Fox Kennedy, Kleary's Grace with Karen at home August 2011. At Kleary Field, LLC. we are breeding the Irish Draught Sport Horse (IDSH) as we think it is a great animal for a wide range of riders and abilities, and, as far as we have seen, wonderful horses to be around in every way. We are also breeding the full Irish Draught as we think it IS THE essential ingredient in the temperament, bone, jump and success of the Irish Sport Horse. So, we are dedicated to helping in whatever way we can to preserve the diversity of the Irish Draught breed. We are a located in Northern California. Each horse is handled daily. We specialize in Irish Draught and Irish Draught Sport Horses. Our horses are bred for jumping. Buy your Irish horse bred in the USA and go to Ireland for vacation! The Kleary Field breeding program focuses on producing equine athletes with superior temperament. In our pursuit of trainable and talented horse partners, we focus on breeding two different but related animals: the Irish Draught (ID) and the Irish Sport Horse (ISH). The Irish Sport Horse (in the USA sometimes referred to as the Irish Draught Sport Horse) is a Warmblood known for outstanding jumping ability, athleticism, movement and most importantly, wonderful temperament. With a Studbook maintained in Ireland, the Irish Sport Horse is traditionally a cross of the Irish Draught with the thoroughbred in some proportion. This cross was previously called an Irish Hunter. Irish Sport Horses are perhaps most popular in the equestrian sport of Eventing, and The Irish Sport Horse Studbook has led the Events rankings of the World Breeding Federation for Sport Horses Eventing for 13 consecutive years. Undeniably, the Irish Sport Horse has excelled in Eventing--think 2008 Horse of the Year, McKinlaigh who is half Irish Draught or David O'Connor's gold metal mount the ISH Custom Made. Irish Sport Horses are also strong in the world of showjumping with past stars like Special Envoy (ridden by both Rodrigo Pessoa & Nelson Pessoa) and up-and-comers like Rich Feller's mount Flexible (or Flexible's sire the Irish Sport Horse Crusing). Each of these horses mentioned has at least 1/4 Irish Draught blood. At Kleary Field we breed the Irish Sport Horse particularly for the local market. We think the sport horse is a great animal for a wide range of riders and abilities, and, as far as we have seen, wonderful horses to be around in every way. We breed the first cross, or halfbred as it is called, considered the strongest result with hybrid vigor, We also bred the 1/4 Irish Draught (with 3/4 Thoroughbred or a combination of thoroughbred and Warmblood). The Irish Sport Horse is a wonderful horse for mature riders as the athleticism of the thoroughbred is tempered with the sanity and good sense of the Irish Draught. Trainers tell is that temperament equals trainability. Riders tell us that temperament equals a pleasure to ride and safe, too. We are also breeding the full Irish Draught as we think it is THE essential ingredient in the temperament, bone, jump and success of the Irish Sport Horse. 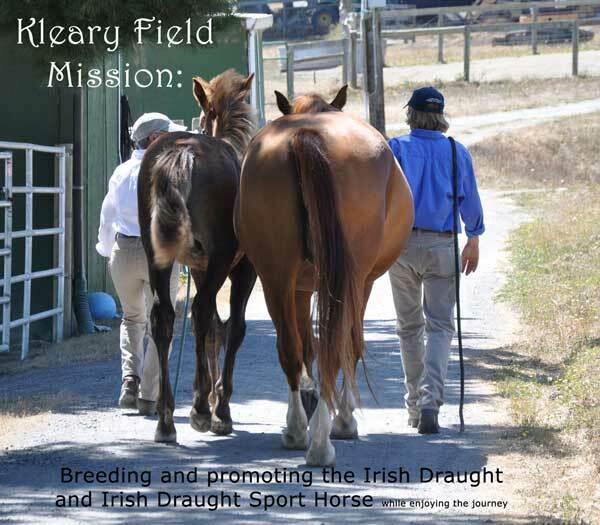 The Irish Draught is a rare breed and Kleary Field is dedicated to helping in whatever way we can to preserve these special animals. The Irish Draught Horse is an active, short-shinned, powerful horse with substance and quality. It is proud of bearing, deep of girth and strong of back and quarters. Standing over a lot of ground, it has an exceptionally strong and sound constitution. It has an intelligent and gentle nature and is noted for its docility and sense. Traditionally, the Irish Draught is versatile and athletic with a wonderful temperament. The farmers required a horse who was sound and sane--a dependable horse for farming, who was also charged with taking the family to church on Sundays. They needed good movement both for taking product to market at a decent clip and for fox hunting. So now you see why the Irish Draught and Irish Draught cross, with more than a century of jumping bred in, is an ideal choice for the amateur owner/rider. As a working breed, horses who were unsound or had a poor temperament were not bred on. And, as Cindy sees it, the farmers bred for the jump to ensure their bragging rights at the pubs. The Irish Draught carries a long history of soundness and sanity and a jump worth bragging about. At Kleary Field, our Irish Sport Horses are purpose bred for jumping performance. Our Irish Draughts are bred to the highest breed standard. All our equines are bred with an eye for producing quality breeding stock as well as useful and fun family friends. Each horse at Kleary Field is handled and loved daily. We expect performance, but we demand respect on the halter, in the pasture and when the time is right, in training under saddle. Less a system or method than a technique we have successfully backed each foal right here on the ranch. The small breeding operation, with yearlings living with two-year olds creates a kind of positive peer pressure to perform. The young horses want to be the one chosen to hang out with the humans. When they are ready, the horse will wait at the gate. Cindy gets on, Karen leads on the halter, and eventually we walk around the property, graduate to a saddle, then a bridle, then a trail ride. After each step, we all eat carrots, and the horse goes back and brags to their pasture mates. Not long after, another horse is waiting at the gate. If you are looking for a quality horse, something sane and trainable, for your next mount, we invite you to visit our ranch and meet our family. At Kleary Field, our Irish Sport Horses are purpose bred for jumping performance. Our Irish Draughts are bred to the highest breed standard. All our equines are bred with an eye for producing quality stock as well as useful and fun family friends. Each horse at Kleary Field is handled and loved daily. We expect performance, but we demand respect on the halter, in the pasture and when the time is right, in training under saddle. All horses bred by Kleary Field are registered with the Irish Draught Horse Society of North America as foals. They are DNA tested and verified. Ask us anything. We can provide the full history of Kleary Field bred horses and upon request, we can provide vet histories as well. The horses of Kleary Field are brave and confident. They are handled and trained daily. And you can be confident of what you are buying. When the time is right, each Kleary Field horse is trained by a professional in a suitable skill. The majority of our horses are broken to ride and taught to jump and/or Event. We do not take shortcuts and we are not in a hurry to over-produce our horses. In each case the professionally trained horse is also ridden, jumped and handled by an amateur We start every horse as if it will be ours forever. Kleary Field horses come with a CD filled with foal photos and videos, upon request. Watch your new best friend from day 1 and relive the excitement of growing up at Kleary Field.